We often receive calls for common hybrids such as Bengals, Savannahs, and Chausies. But this is our first hybrid surrender call for a Safari Cat. What is a Safari Cat? It’s a cross between a Geoffroy’s cat and domestic cat. The Geoffroy’s cat is a small feline species from South America. 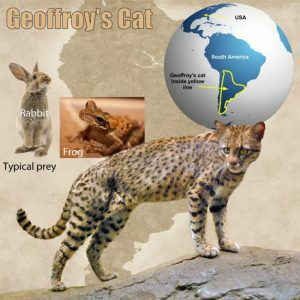 Geoffroy’s cats are the size of small domestic cats. The fur that makes the Geoffroy’s coat so sought-after is marked by small black spots of equal size, spaced evenly over the body. These spots merge into striped markings around the neck, chest and face. As we’ve heard countless times before about other hybrids, Ella was soiling and destroying the house. The owner didn’t make the decision lightly, but did choose to surrender her to our sanctuary where she can live wild at heart. Ella is a melanistic Safari, which means she has a black coat. The breeder bred a Bengal cat with a Geoffroy’s cat, so her coat is more striped than the typical Safari Cat. 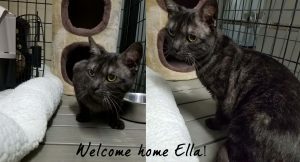 Ella will receive an intake exam and be spayed before she meets her new feline family here in the Hybrid Haven section of our sanctuary. Ella would love to have a sponsor parent, as the other hybrids already have here at the sanctuary. Would you like to be her special someone? And even though she’s a small wild cat, that doesn’t mean the expenses for caring for her are small. Most hybrids come with a myriad of issues and require special care. Thank you so much for the support you give making that possible for little wild ones like Ella. Read more about hybrids, why we do not support buying or breeding them, and more owner’s firsthand stories HERE. 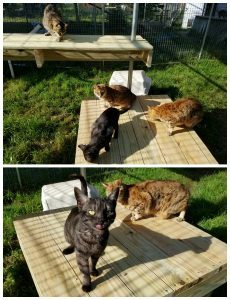 We’re so happy to see how much she’s loving her new life in the Hybrid Haven section of the sanctuary. Ella is one of our most social cats to interns, caretakers, and volunteers. She always runs up for a pet, rolling over for more. We’re happy to provide her all the loving and hugs she wants, she’s such a sweet girl to have around. Thank you for helping us rescue the little wild ones as much as the big wild ones, too!